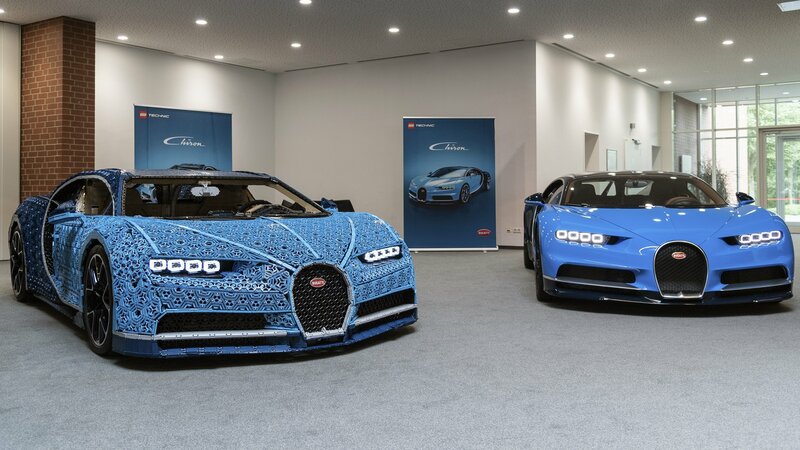 Just when you thought you knew everything about the life-sized, brick-version Bugatti Chiron that LEGO created last year, this detailed look at the incredible creation opens up details that we didn’t know about the replica. 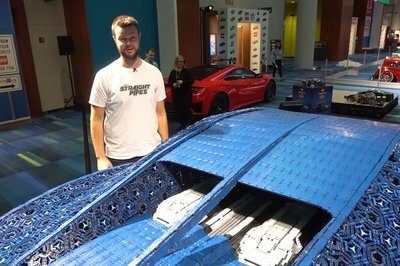 The credit belongs to the folks over at The Straight Pipes, who managed to get an in-depth look at the LEGO Chiron when it was on display at the 2019 Canadian International Auto Show. We know that this replica was created with over one million bricks. That’s old news. What we didn’t know is that most of the LEGO Chiron’s body is comprised of flexible sheets made of bricks that are shaped like triangles. That’s one of the many details you’ll learn from this 10-minute deep dive into what is arguably the sickest-looking full-scale model that LEGO has ever created. Bugatti is celebrating its 110th anniversary this year, and in keeping with its reputation for celebrating anniversaries in style, it’s bringing a special edition Chiron to the 2019 Geneva Motor Show. 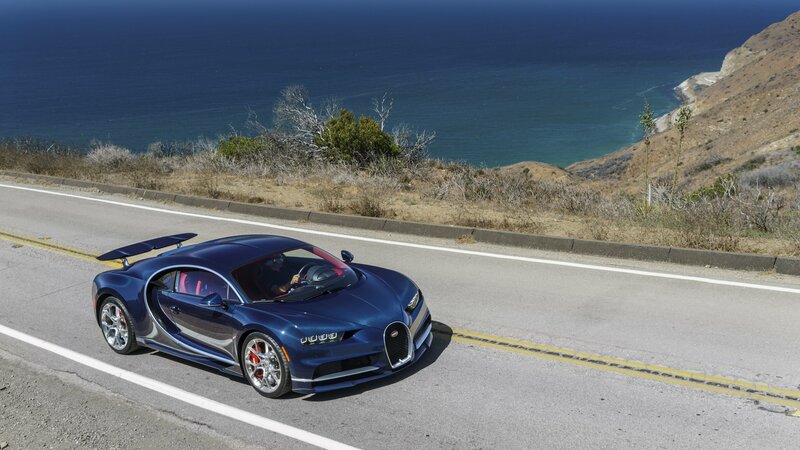 The special edition model, called the Chiron Sport “110 Ans,” is essentially a love letter for Bugatti, from Bugatti. It’s limited to just 20 units, and it’s dressed up in the finest exclusive touches you can find in the business. The special edition ode to Bugatti’s heritage will be the centerpiece of Bugatti’s exhibit in Geneva, though it may or may not be joined by a mysterious one-off hypercar that Bugatti is also rumored to have a spot for in its booth in Geneva. But that’s a different story. 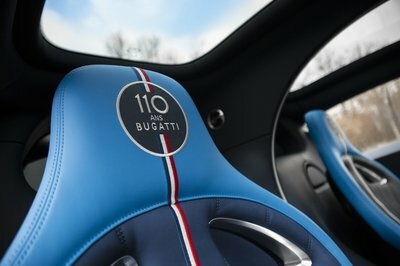 This is all about the Bugatti Chiron Sport 110 Ans Edition, a fitting celebratory piece to Bugatti’s long and storied history in the business. 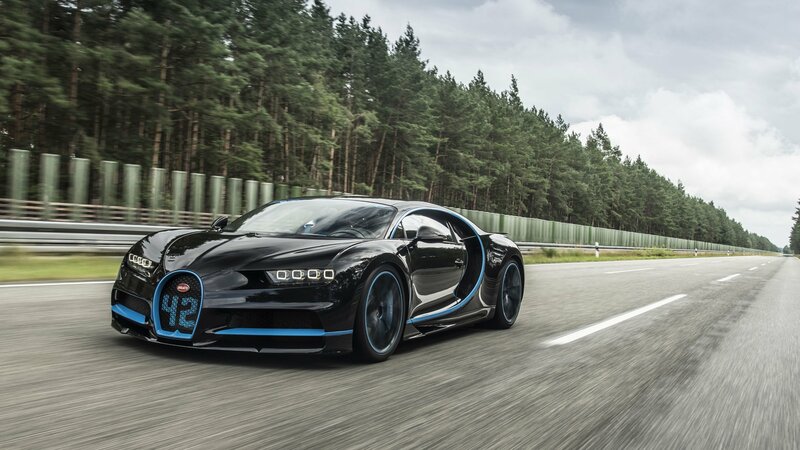 The world has been waiting two years for the Bugatti Chiron to post a top speed run. We’ve been teased about it before, but now it looks all that teasing will be for naught. Bugatti has now closed the door on a top speed run for the Chiron. Word of the company’s decision on the issue comes straight from the mouth of CEO Stephen Winkelmann, who said that a top speed run isn’t in any of Bugatti’s priorities at the moment. Whether that position holds true or changes remains to be seen, but if you’re looking for a threat to the Koenigsegg Agera RS’ world record top speed of 277.8 mph, that conversation, at least for now, starts and ends with the Hennessey Venom F5. Bugatti’s not joining that party, much to the dismay of everyone. John Hennessey thinks Bugatti is playing possum when it comes to the Bugatti Chiron’s top speed. Speaking with Motor Authority, the founder and owner of Hennessey Performance claims that the French automaker is “sandbaggin’” the abilities of the Chiron as the race to hit a 300-mph top speed heats up in the supercar world. If Hennessey’s claims are correct and Bugatti is intentionally downplaying the Chiron’s performance abilities, it adds another wrinkle to a budding rivalry that’s showing no signs of slowing down anytime soon. At the other end of life, at the other end of the universe, and at the other end of money people are actually thinking of increasing the power output of Bugatti’s W16 engine. You know – the one that produces 1479 horsepower for the Chiron, 1184 horsepower for the Veyron Super Sports, and 987 horsepower for the Veyron. How to proceed? 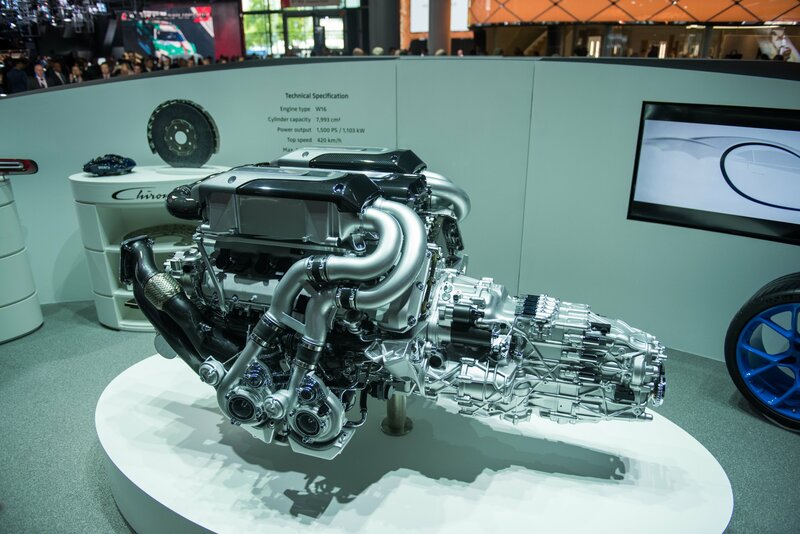 What will the future make of the famed 16-cylinder engine that was developed from that awesome Volkswagen W12? That question is occupying the great mind of Stephan Wilkenmann, Bugatti CEO, as he walks in his haute couture suits with a neverending smirk on his face. Does it bother him? I would not say so as he just sold 40 Divos for 5.8 mil a pop even before unveiling the car. He could sell all remaining Chirons, too. Right now! However, he has to slow down and let the Chiron live its full life. That is more than 8 years. What happens after that? The W16 will be too old, and according to Winkelmann’s talk from the Divo presentation, it already operates almost at the edge of its capacity. In other words, the W16 cannot churn much more power without sacrificing some of the reliability, or refinement. If it sacrifices any of it, it would not be a Bugatti then, would it? Keeping kids happily busy since 1949, LEGO has evolved from a company that builds plastic construction toys into one that makes complex models with technical functions through its Technic division. Following a series of scale models based on existing cars, LEGO Technic just launched a life-sized, fully functional Bugatti Chiron. The Bugatti Divo is drawing closer to its highly anticipated debut at the Pebble Beach Concours d’Elegance this coming August. Precious details have been revealed about the hypercar, but it is expected to be a more evocative version of the Chiron, one that will be coach-built and more driver-focused. 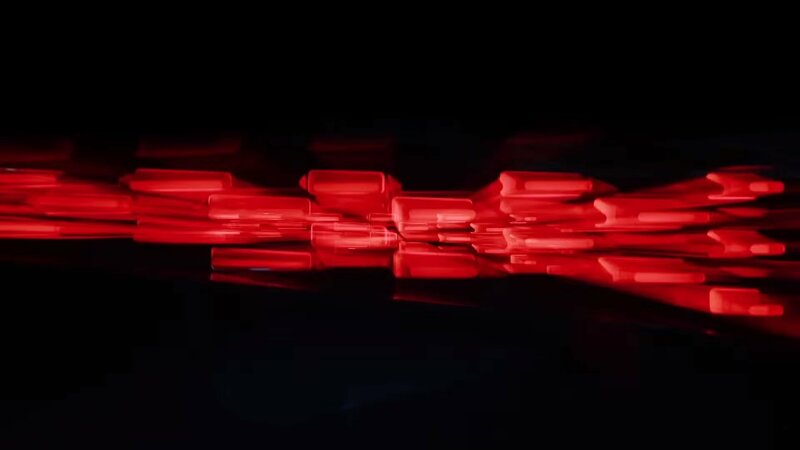 In the absence of any meaningful information, Bugatti has released a teaser video of the Divo, specifically the raunchy taillights that are completely different from what the Chiron has. 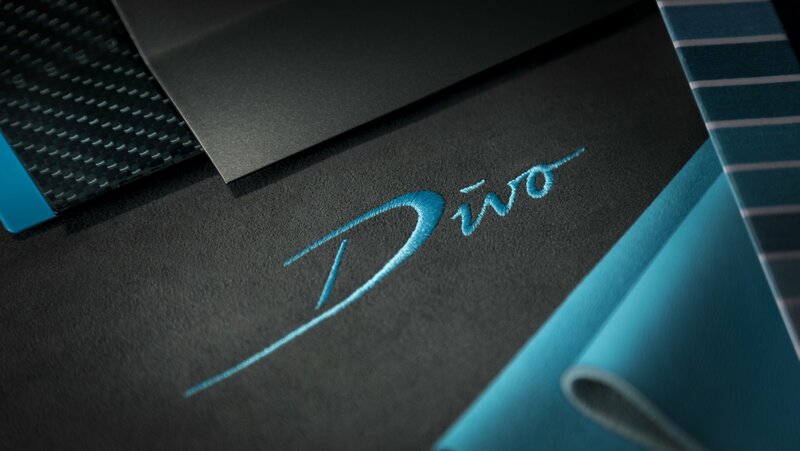 Could this be a sign of what we can expect from the Divo? It certainly appears like it. Hello There! 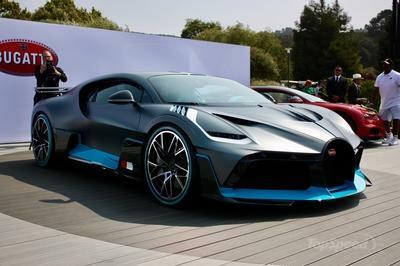 Are You The Bugatti Divo? A heavily wrapped Bugatti Chiron-based prototype has been spotted at the Nurburgring, triggering alarm bells that this model could be none other than the limited edition Divo that Bugatti announced just last week. 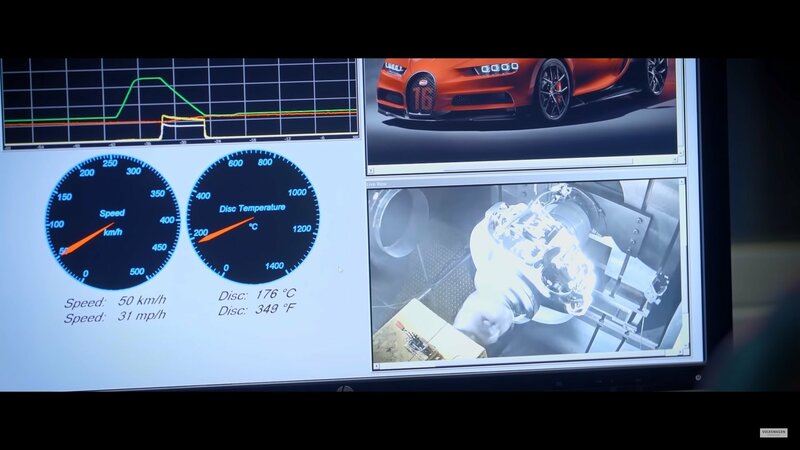 There are no indications that this test mule is, in fact, the Divo, but with little news on the front of other Chiron derivatives these days, it stands to reason that Bugatti wouldn’t send a prototype to the ‘Ring to do testing if it has no plans to do anything about it. The Bugatti Chiron exceeds at excess. 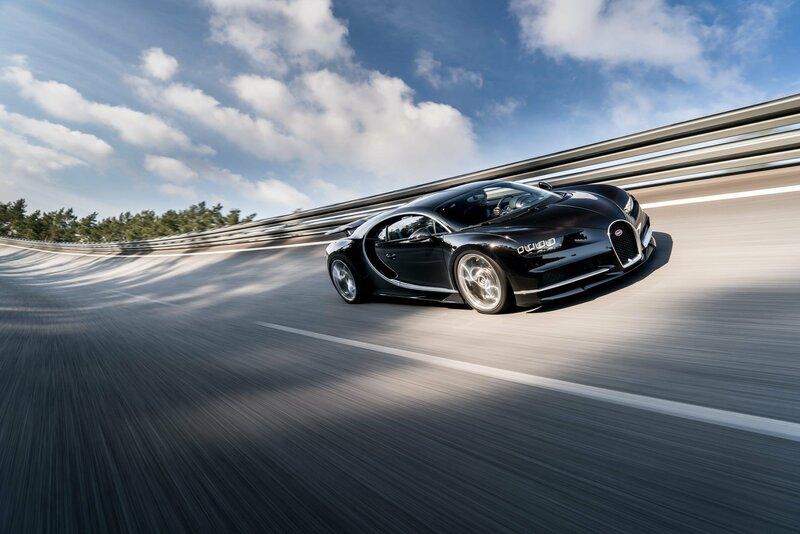 The speed, the power, the price… any way you slice it, the Chiron is way over the top. However, despite this overarching emphasis on velocity, the Chiron was never a particularly agile vehicle, instead relying on its mammoth grip and high-tech AWD system to move the mass around an apex. Now, however, it looks like that might change, as the top bug is gearing up for a fresh limited-run edition that emphasizes cornering in a whole new way. The Bugatti Chiron is one fine piece of automotive art and now that the Lego Technic Bugatti Chiron has made its debut, it’s only fitting that we learn all about the engineering that went into the Chiron. And that’s exactly what Carfection set out to do. As a fair warning, I have to advise you that the video goes beyond the 15-minute mark, but when you use the term “everything you want to know” about one of the finest automobiles in the world, you couldn’t really expect much less. After all, the Chiron delivers 1,479 gut-wrenching horsepower from a massive 8.0-liter W-16 engine that sits all of the way in the rear. This baby can sprint to 60 in 2.5 seconds and tops out at a number that only God (and maybe Bugatti) knows. Truth be told, there’s rumors that it can go over the 300 mph mark, but Bugatti won’t try because no tire in existence today can handle such speeds without ripping to pieces. But, I digress. Let’s get back to that video. Go ahead and click play, and learn everything there is to know about the engineering that went into building one of the finest, fastest, and most expensive cars in the world! Bugatti only plans to build 500 Chirons, and the French automaker just built its 100th Chiron last week. As expected, it commemorated the occasion by throwing a party in its headquarters in Molsheim, France. The 100th Chiron is expected to go to a customer in the Middle East, who dressed up his new hypercar with a number of exclusive touches, ultimately settling for one that comes with a net price tag of €2.85 million, or somewhere around $3.33 million. 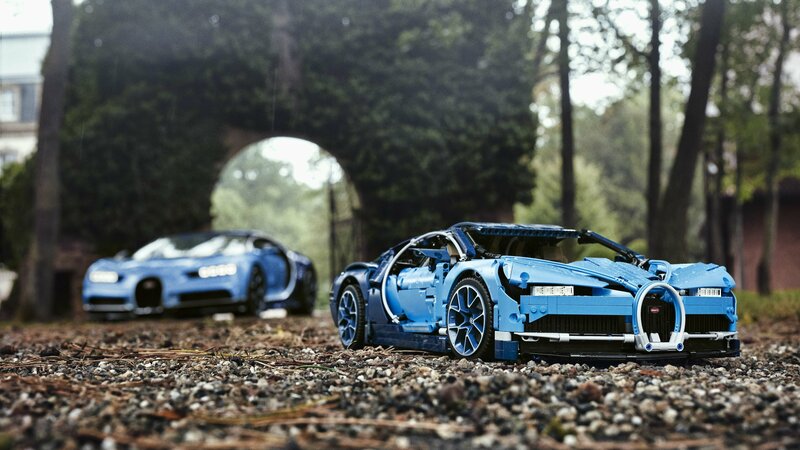 The new Lego Technic Bugatti Chiron set has arrived with extreme detail, a traditional bi-colored blue paint scheme, and a W-16 engine with moving pistons. 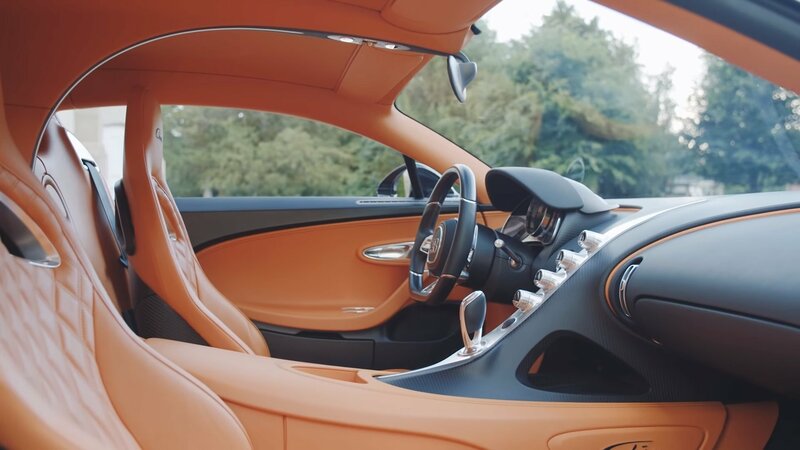 Priced at $349.99 in the U.S., it doesn’t come cheap, but the detail is out of this world, including a life-like cabin with a Technic eight-speed transmission, movable paddle shifters, and a Bugatti emblem on the steering wheel. The exterior features all of the aerodynamic enhancements of the real thing, and to top things off, if you insert the top speed key, the wing will transition from the handling position to the top speed position. The engine even has moving pistons and extreme detail like we’ve never seen before on a scale model. These days automakers and corporations have just as many leaky holes as the U.S. Government. And, we’re not even kidding. How many “leaks” have we seen of cars just days before the debut in the past 12 months? It’s honestly starting to become commonplace. 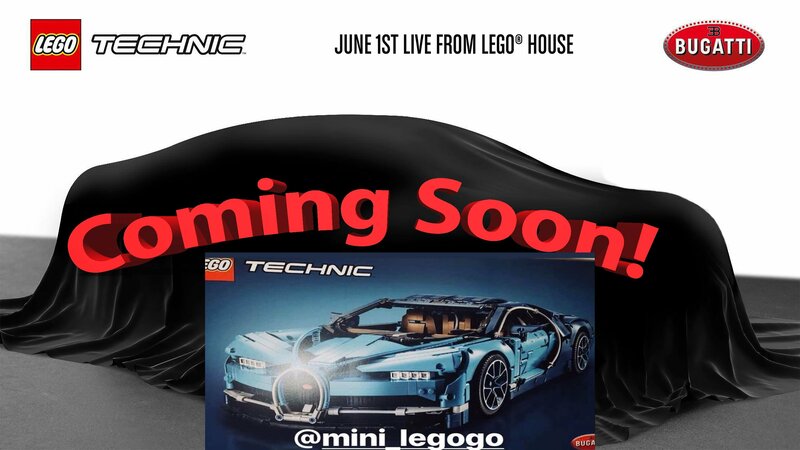 And, that’s why we’re here as just hours after the Lego Technic Buggati Chiron kit was teased. It turns out that someone couldn’t wait to share the kit with us and has decided to leak out an image of the box. We can’t see the full box, unfortunately, but what we can see gives us insight into the most essential information. First, we know what it looks like. It’ll carry the traditional dual shades of blue and will apparently feature that light tan interior. There are even tiny square Lego pieces to make up the LED headlights up front – now that’s attention to detail. Furthermore, it will carry the set No. 42083 and will come in a total of 3,599 pieces. That’s nearly 900 pieces more than included with the 911 GT3 RS and more than enough to keep you busy for a while. That 911 GT3 RS Lego kit, by the way, retails for $299, so you can probably expect to shell out even more for the Chiron. We’re guessing it’ll carry a price tag somewhere in the $375 to $400 range, but this is Bugatti we’re talking about so it could even go for more and people would buy it up like it’s going out of style. Speaking of going out of style, Motor1 reports that the GT3 RS Lego kit will be pulled off shelves at the end of 2018 as it heads into its peaceful retirement. That means unopened kits will increase in value and they’ll be harder to get by the turn of the year.